“…I found Dr. Bauman’s staff to be extremely professional, friendly and attentive. For thousands of years, man has searched for topical ‘lotions and potions’ for hair regrowth. Thankfully, medical science has provided what generations and generations of hair loss suffers have sought… FDA-Approved Hair Regrowth Medications! The twice daily application of minoxidil, the fda-approved hair regrowth drug in the over-the-counter Rogaine, if used correctly and consistently can help regrow, strengthen and improve failing follicles*. However, if the follicles are ‘dead and gone,’ there is little hope for regrowth, only maintenance of existing hair. New breakthroughs in the field of cosmetic chemistry and pharmacy have improved minoxidil formulations considerably since the FDA granted its approval to the Rogaine/Minoxidil recipe decades ago. Several new potential topical medications (like Latisse/bimatoprost) are currently being tested in clinical trial settings in the hopes to gain FDA-approval. Topical lotions are not a ‘miracle cure’ for hair loss, but they are an important part of an effective hair restoration regimen and often teh first-line of approach for women with hair loss. For more information on topical therapy and the latest compounded, prescription versions of minoxidil (Formula 82M, propylene glycol-free minoxidil, etc.) contact Dr. Alan J. Bauman, MD atEmail Dr. BaumanNEW: Dr. Alan J. Bauman’s ‘white paper’ on pharmacy-compounded minoxidilFormula82M will be distributed to the medical community at the next International Society of Hair Restoration Surgery Annual Scientific Meeting. Scroll down to read/download the special report. As one of the first physicians to routinely use Latisse (bimatoprost 0.3%) topically for eyelash growth off-label, prior to the FDA-approval, Dr. Alan Bauman and his patients often wondered… what will this powerful eyelash-growth treatment do for those with scalp hair loss? As more information about safety and efficacy came to light from research, Dr. Bauman began prescribing Latisse/bimatoprost ‘off-label’ on a trial basis for a select number of patients. The majority of these patients reported positive experiences with the medication, without side-effects. One of these Bauman patients, Rich P., was interviewed in a recent New York Times Article on “Hair Loss Treatment Strategy” and featured on Good Morning America (ABC News). Watch the video below for the GMA/ABC News clip. ROGAINE / MINOXIDIL/ FORMULA 82MIn the late 1970s, the American drug company Upjohn created a drug called Minoxidil. This medication was first administered internally (orally) to patients who were suffering severe high blood pressure. As a side effect of the drug, it was discovered that patients grew hair on various parts of the body. And, in some patients, when applied externally as a lotion, directly to the fine hairs remaining in a thinning area of hair on the scalp, the 2% solution of minoxidil was shown to start the hairs growing longer and thicker. Currently produced under the trade name of Rogaine Topical SolutionTM, the medication’s exact mechanism of action is not completely understood. We know it stimulates and prolongs hair follicles’ active growth (the Anagen phase), causing the hairs to thicken and grow longer and needs to be used consistently over time. Minoxidil is helpful in slowing down the rate of hair loss in approximately 70%-75% of patients; and, about half of all patients experience some visually significant hair regrowth with consistent use. Rogaine Topical SolutionTM is available over-the-counter (without a prescription) in both 2% and 5% concentrations and in generic forms. To be effective, the solution should be applied to your scalp twice daily. Unfortunately, more than 10% of patients experience significant scalp irritation requiring them to stop the medication. Rogaine/Minoxidil also very often interferes with hairstyling in many patients interfering with its use.Compounded/Prescription Minoxdil More than twenty years after minoxidil was discovered to improve hair growth, the “Rogaine Recipe” has changed very little. However, cosmetic chemistry has changed quite a bit! Today, minoxidil can be compounded by select pharmacists to improve its tolerability, increasing its hair growth potential and decreasing side effects. The most sophisticated minoxidil available today is called “Formula 82M” and is available to patients of Bauman Medical Group. 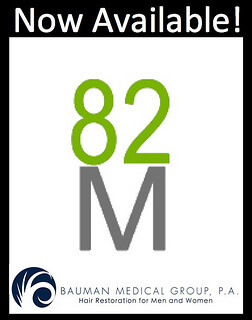 With a variety of clinically-proven ingredients that decrease side effects, increase the penetration of minoxidil (and results) as well as improve its ease-of-use, Formula 82M is a dramatic improvement over the old Rogaine formula. Formula 82M is by far the most popular minoxidil amongst Dr. Bauman’s patients. Rogaine 5%, 2% Solutions, Rogaine 5% FOAM and generic Minoxidil are available over-the-counter and also from Dr. Bauman’s office. Customized Minoxidil formulations (including propylene glycol-free versions, 10% minoxidil cream, etc.) are also available from Dr. Bauman. Jan 2007: New Rogaine 5% FOAM is now available. The thermolabile foam breaks down on contact with your scalp and does not contain Propylene Glycol (a common irritant). Patients are noticing that the FOAM is easier to apply and does not cause itching or irritation. 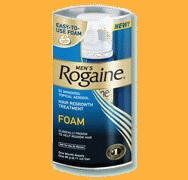 Rogaine FOAM is available over-the-counter or directly from Bauman Medical Group. Rogaine 5% FOAM is FDA-approved for men only, but Dr. Bauman recommends 5% Rogaine/Minoxidil to both men and women. Call 561-394-0024 to find out if Rogaine is right for you, or to order a direct shipment of Rogaine FOAM delivered to your doorstep. How to Apply Minoxidil: Dr. Alan Bauman recommends to patients that you shampoo and towel-dry your hair before applying the minoxidil solution. We also suggest using the dropper applicator to spread the solution over the entire top of the scalp and allow it to get onto the skin where it can do its job. We counsel patients to understand that it will take at least four months before you will notice less hair falling out; and, at least seven months to see hair re-growth. Usually, this re-growth will be fine, short (vellus) hairs. Minoxidil must be used continually as prescribed over the long-term in order to maintain its beneficial effects. If you stop using the medication, you will eventually begin to lose your hair again. The main side effects of minoxidil, which occur in up to ten percent of patients, are dermatologic: skin itching, scaling and redness can often be dramatically reduced by using a prescription version of minoxidil, like Formula 82M. Minoxidil can be used safely by both MEN and WOMEN. Minoxidil is considered the “first-line“ of therapy for women with hereditary hair thinning. Today, compounded prescription minoxidil is available which may be more ‘user-friendly’ than the over-the-counter version. Contact Dr. Alan Bauman for more information. Q. Can I tell how much hair loss I will experience by looking at my mother’s father? Q. Am I less likely to go bald because my hair grows so fast? Q. Is it true that the more often I shower and shampoo, the more hair I’ll lose? Q. True or false? Bad lifestyle decisions won’t accelerate my hair loss. Q. Is brushing my hair is better than combing it? Q. Can stress cause my hair to fall out?